I thought ya'll might like a pic of my boat so far, I took it out yesterday for its first run. I still have a little finishing work to do but it was fun. I'll send you the finished product when I'm done with a small story. I'm the one behind the wheel, and that is Tom sitting on the deck (he helped me build the boat). Tom is a craftsman when it comes to building boats, he has built sail boats for years and this is his first power boat. I built one of your Console Skiffs about a year and a half ago. I made a couple of changes to more suit my needs. 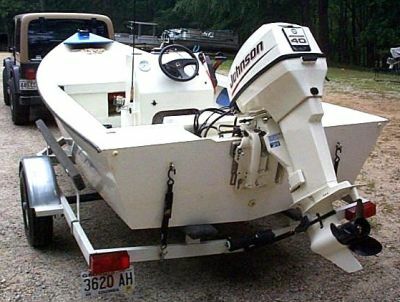 It is a great boat and I get a lot of compliments on it. I sent you a picture of it the first day I put it in the water. Since then I have added quite a few extras including the swap from the 25 hp to 40 hp, and what a difference. I have attached a new and updated set of pictures of the boat. ...if you could update the picture in you photo album I would appreciate it. People ask me about your web site and when they look at the boat it doesn't do it justice. Once again thanks.